Want to give a new ambience to the bedroom? 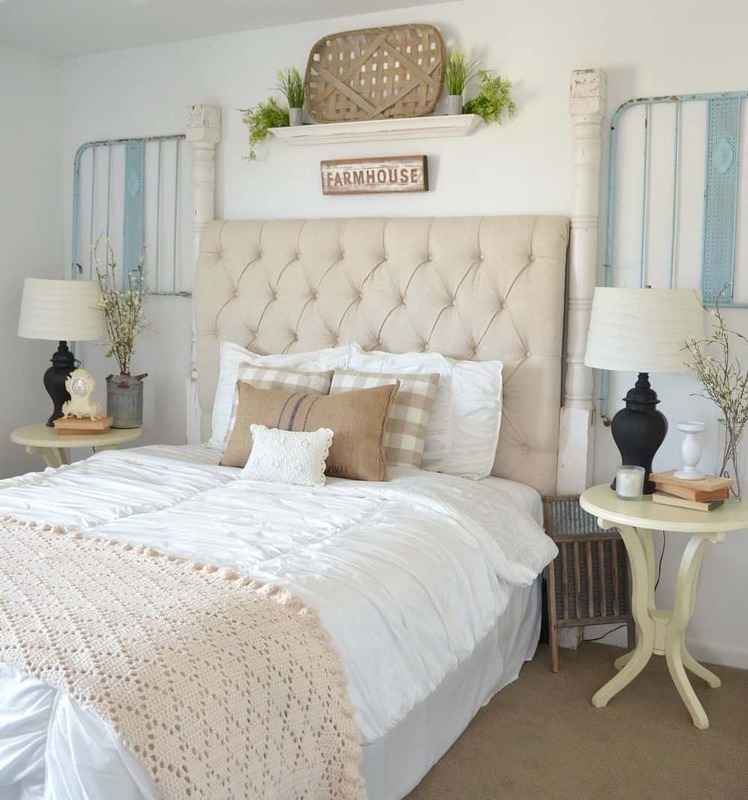 A farmhouse bedroom can be the best option. That’s because a farmhouse decor can bring a tranquil and warm mood into your room. Although the basic concept of this interior design takes the energy of farmland, it still can be applied to an urban home. 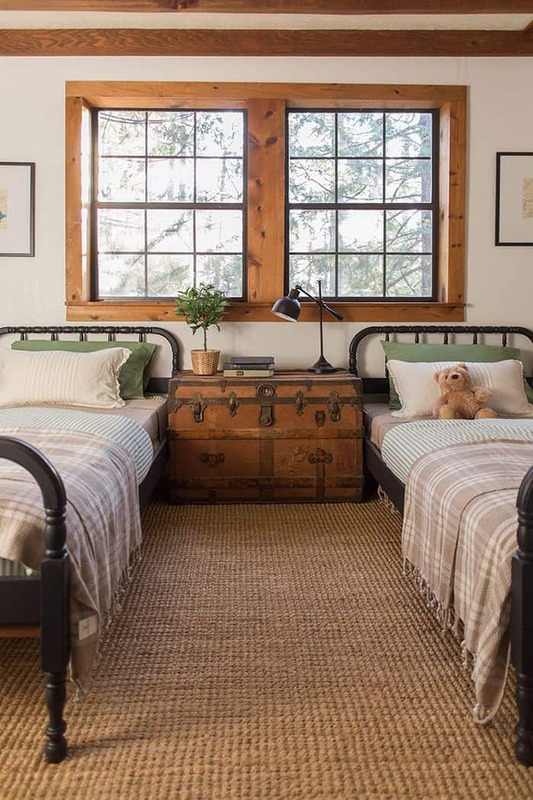 So, here are some inspiring farmhouse bedroom designs for you. 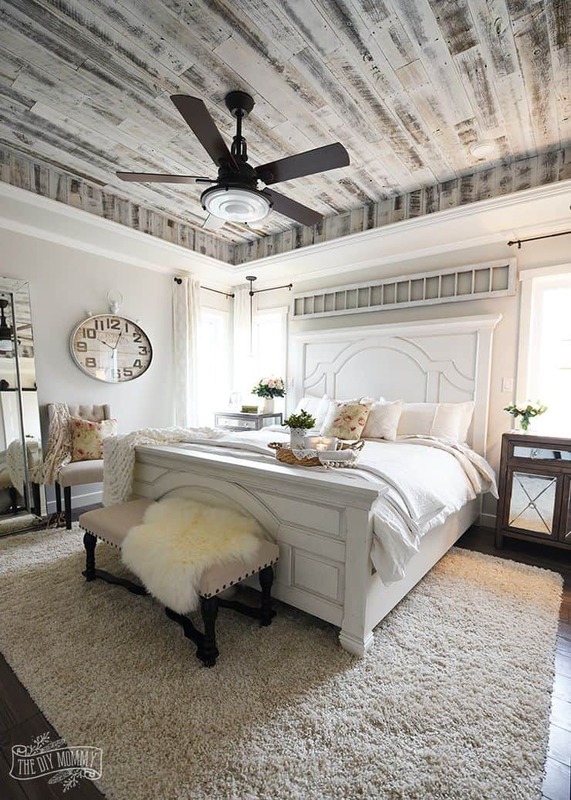 The rustic wood ceiling changes the atmosphere of the bedroom. The distressed look gives an eye-catchy combination with the white king bed. This modern farmhouse bedroom is something. Do not forget the accent of fur rugs to provide a warm and cozy ambience. In order not to seem monotonous, add a beautiful flower pattern cushion. The room features a warm-look queen bed with white cushion ornaments. 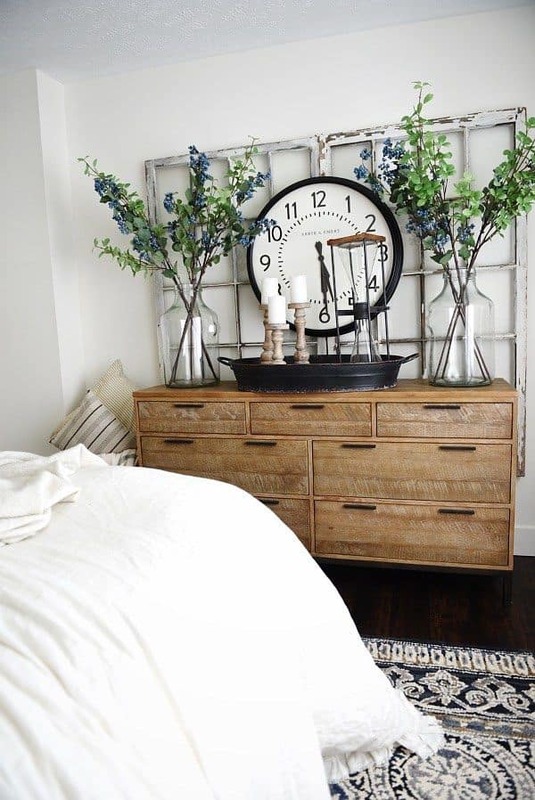 The neutral colors are chosen to provide a space for a lovely charcoal headboard. 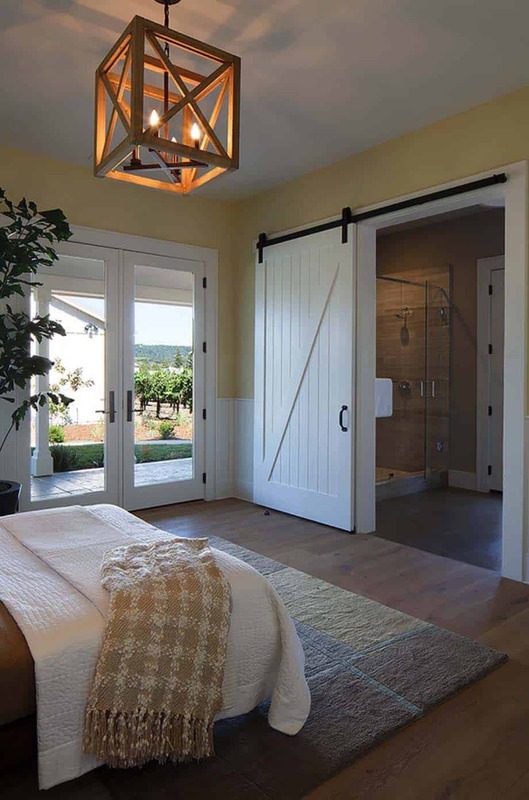 To strengthen the impression of rustic, the farmhouse bedroom also uses wood elements at the floor and ceiling. Furthermore, the antler deer is applied to accentuate the wall. To build an adorable farmhouse bedroom, do some experiments. Accent the right and left side of the bed with a pair of chic wall sconces. Also, give an industrial touch by showcasing unique wall decorations. Further, don’t forget the unique panel bed with its distressed look. This DIY farmhouse decor is very lovely. The dominance of white does not make the room look monotonous. It provides space to other ornaments to shine more. A carved wooden drawer becomes a center of interest in the room. The distressed finish makes it a highlight that enlivens the room. Give a bold touch to the interior design of the bedroom. 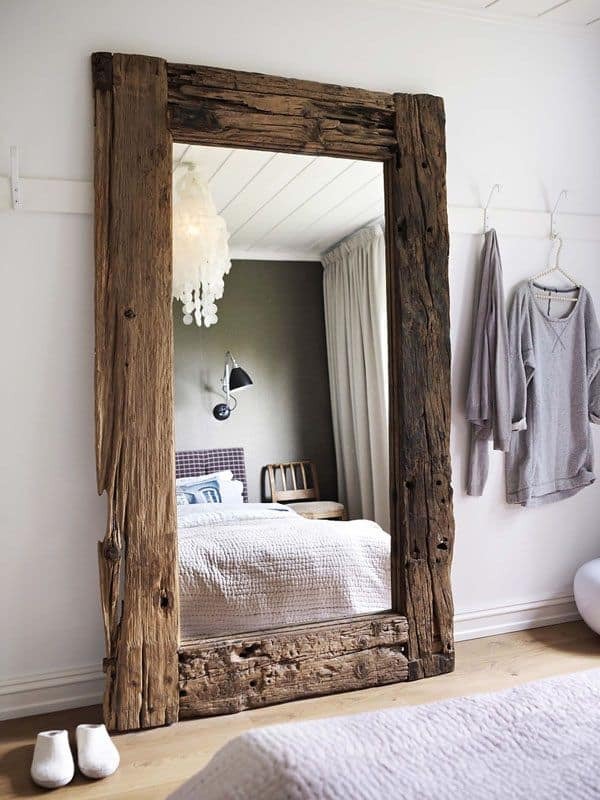 Place an oversized rustic wooden mirror in the center of the room. It’s better not to polish it, leave the wooden frame as is. Then the right and left sides of the mirror can be fitted with clothes. 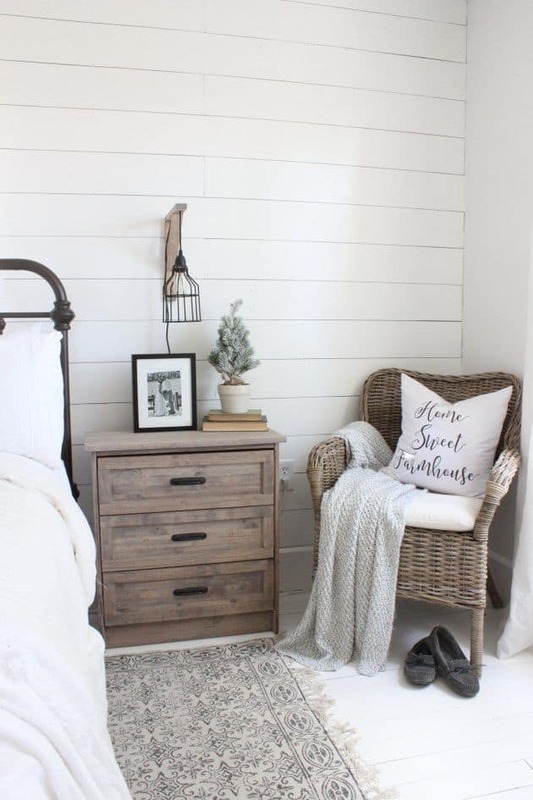 With that simple decoration, your farmhouse bedroom will look alive. A farmhouse bedroom possesses a strong natural impression. 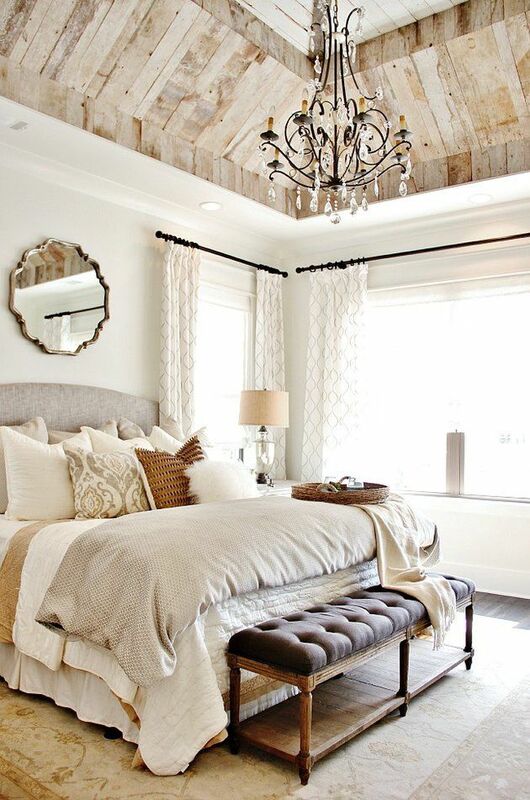 So, the wood elements and rustic colors are the keys to create a chic bedroom. A mixture of a simple wooden bedside table and black sconces are perfect. The virtue will be complete if you combine it with a comfortable panel bed. You can put some contrasting ornaments in the farmhouse bedroom. For example, you can insert the blue pastel geometric curtains. Complete the look with a matching colored bedside table too. To manage the rustic touch, a wooden floor can be a nice accent. Want to make over your bedroom? 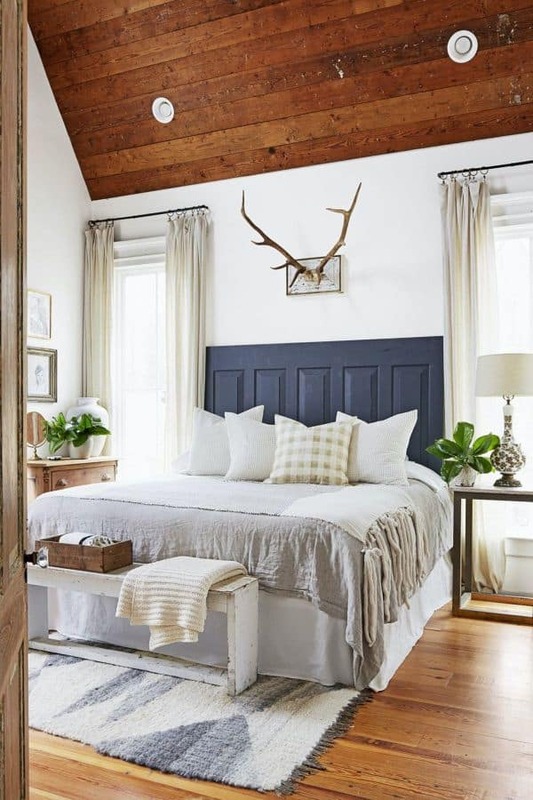 The farm-style bedroom can be an exciting inspiration. Add lots of comfy stuff like a striped blanket, white rug, some plants, and comfortable wooden chair. You can also put a hanging candle holder to improve the room. 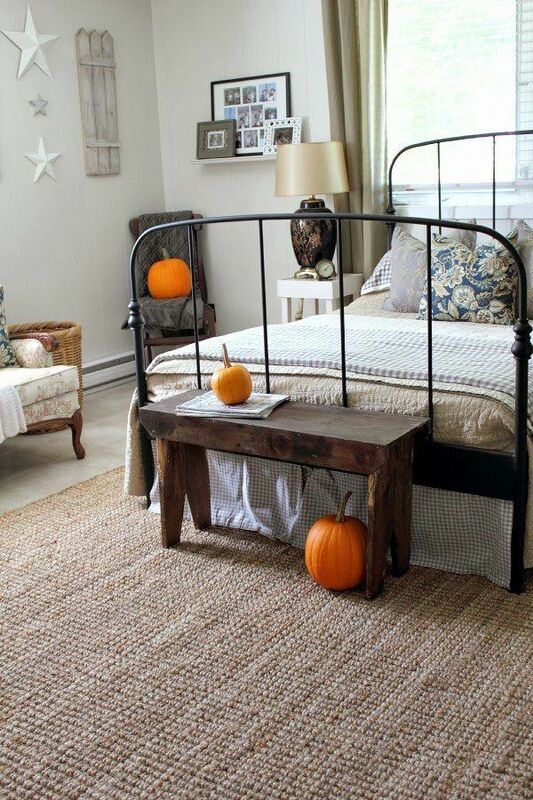 A farmhouse bedroom always brings the spirit of fall. You can continue to see the joy of fall by placing a stylish panel bed or hang a white lace curtain at the wood beam. The selection of white for the walls and ceiling also gives a bright view. Simple details like a super warm knit blanket can also accent the room. Let’s decorate your master farmhouse bedroom with something catchy. Put a fresh detail like pumpkin decor in the room to give a new color. Complete the room with a simple wooden chair at the end of the panel bed. Lastly, perfect your rustic space with a natural fiber hand-woven. The farmhouse design is also suitable for children’s rooms. You can decorate it by placing a natural fiber hand-woven as a mat on the floor. Then put two simple wooden beds. Embellish the room with a treasure-box-like table in the middle. Also, give interesting details on the window by adding wood elements. 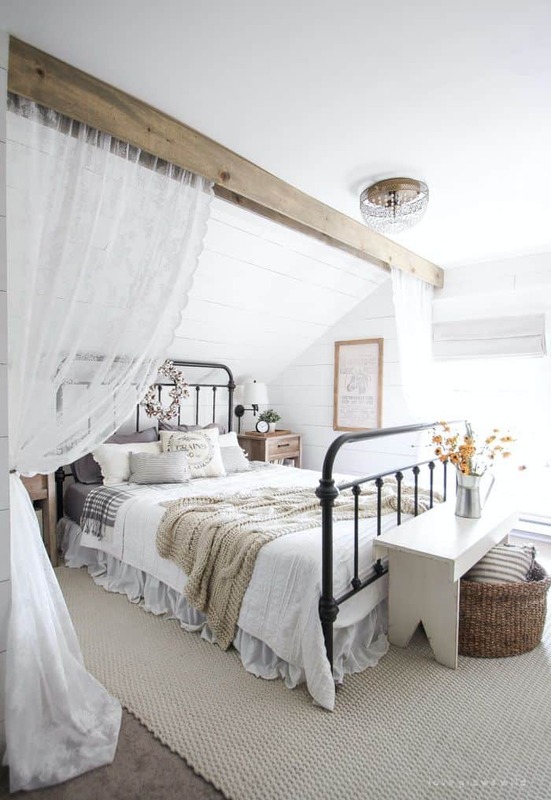 This white farmhouse bedroom offers a cozy and warm atmosphere. Sure, the wood burning fireplace is an impressive detail in the room. Furthermore, there are some chic wood beams which were applied at the ceiling. Not only enhance the rustic design, but it also gives a beautiful accent to the overall look of the room. Having a farm-style room doesn’t mean that you can’t highlight the elegant side. Add a tuxedo-style chair and some white geometric curtains to the bedroom. A ceiling lamp is also a glamorous accent that enhances the ambience. 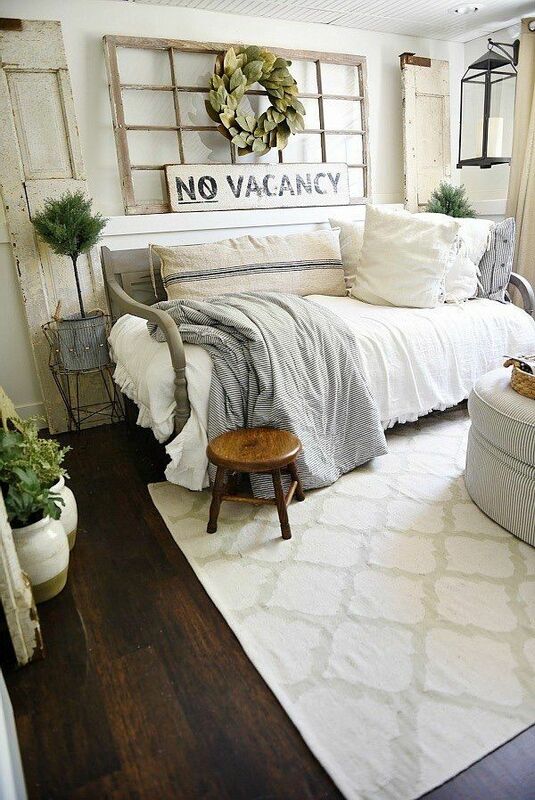 Want to give a rustic accent to your bedroom? You might need a new wooden dresser. Place it at the end of the bed and decorate the top with lovely ornaments. You can put two flower vases at the top or set candle holders. The bed is an essential thing that should not be ignored when arranging a room. For a more simple but sturdy look, a wooden bed is the best choice. 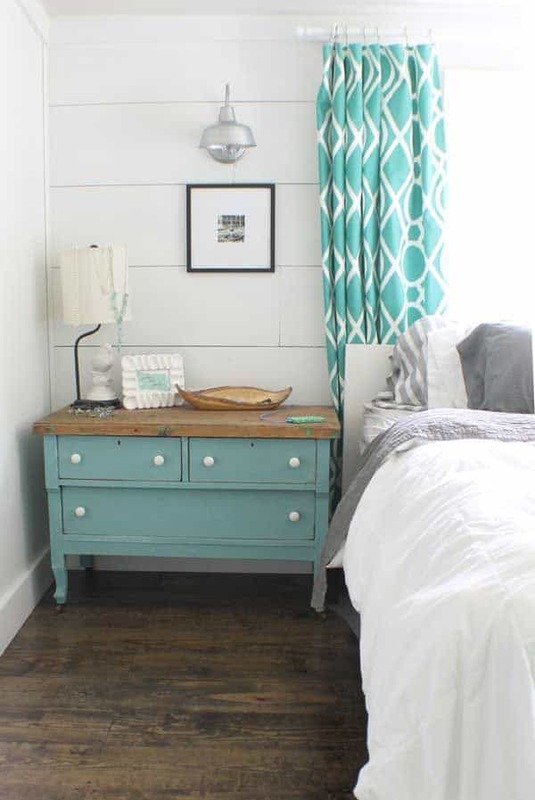 Add other details to the room such as the bedside table and abstract pattern rug. A cream color can be the best option for creating a chic bedroom. Add a super comfy knit blanket for a nice detail. A simple side table with cream color also gives a warm and soft impression to the room. To accentuate the room, the headboard shades must be darker. Combining rustic and modern style can be a unique way to decorate a home. So, simply add wood elements to the door and floor of the room. 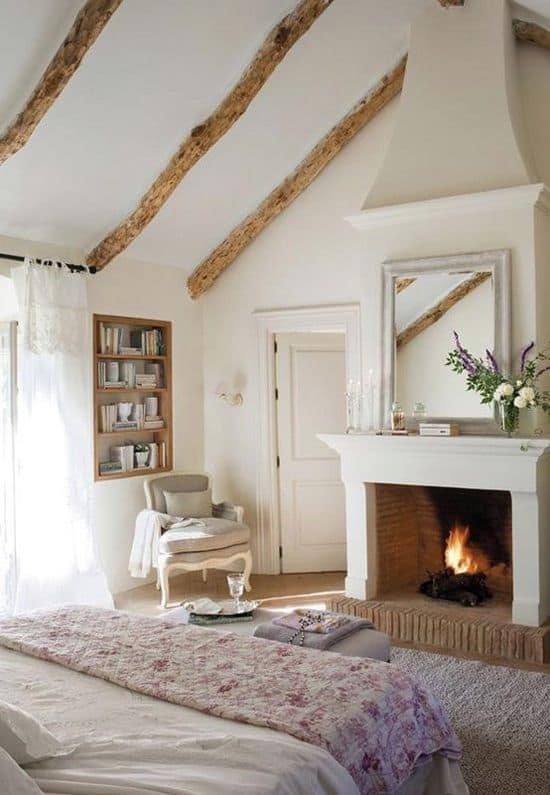 Then, give some chic details like a warm knit blanket for the bed, a thick rug, and a unique wooden ceiling lamp. 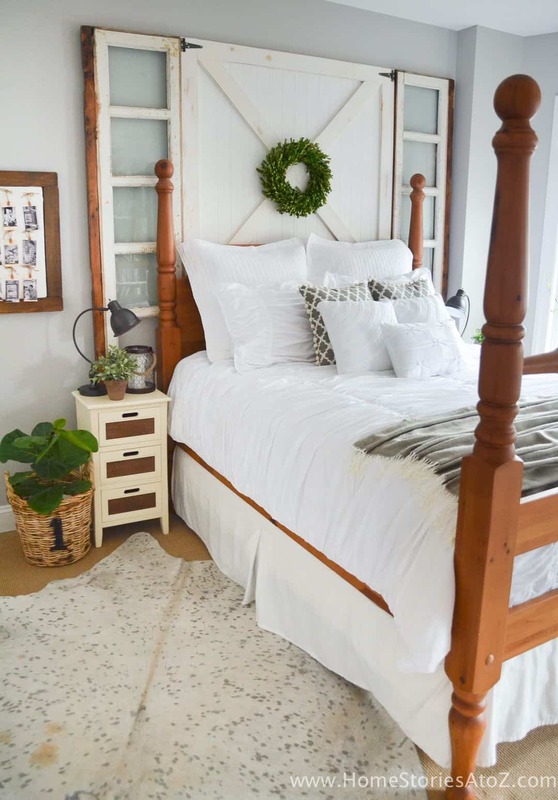 This DIY farmhouse decor will make your bedroom more attractive. Grey is not a boring color if you can manage it well. 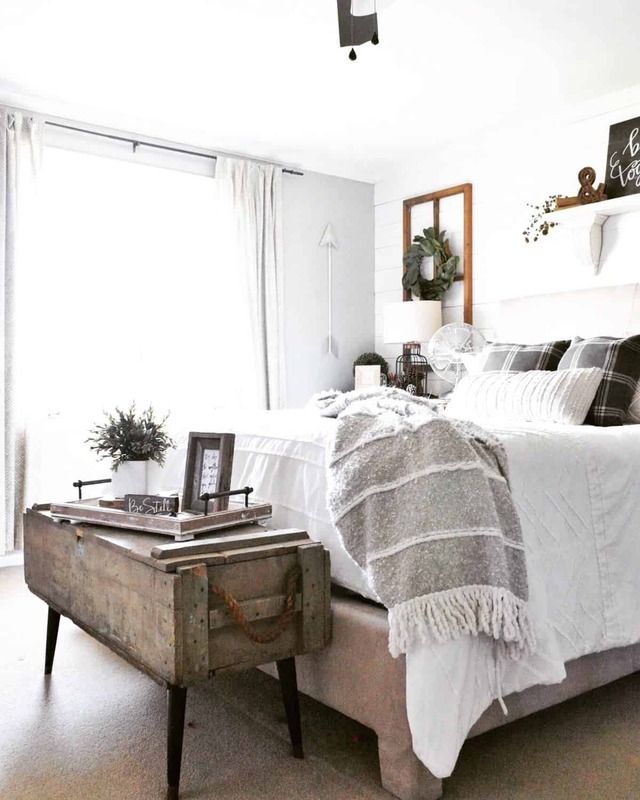 To combine it with rustic elements, put a striped grey rug, a checkered grey bed cover, and some grey knit blankets. Then, perfect it with a brown knit couch and distressed-finished chair. 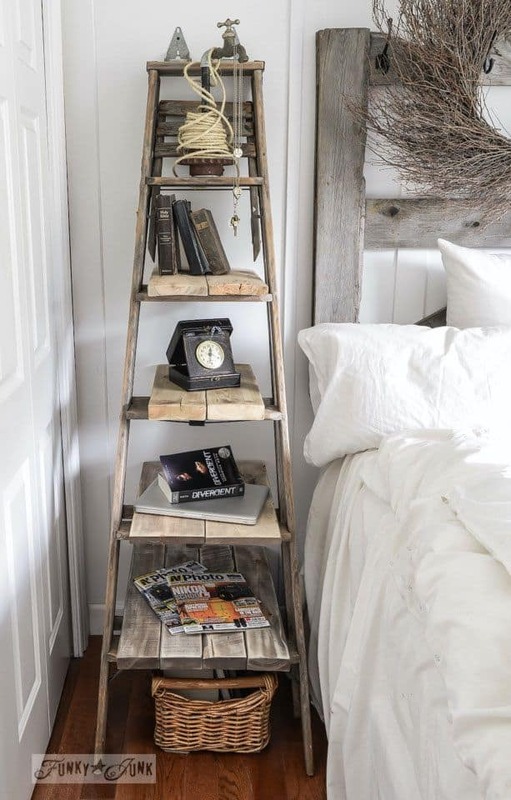 A step ladder table can be a rustic accent in a farmhouse bedroom. The furniture also has a chic distressed finish. Furthermore, you can use it to put some decorations such as an old clock, magazines, and so on. For a catchy detail, enhance it with a salvaged water tap at the top. Perhaps you want something simple and not too flashy. 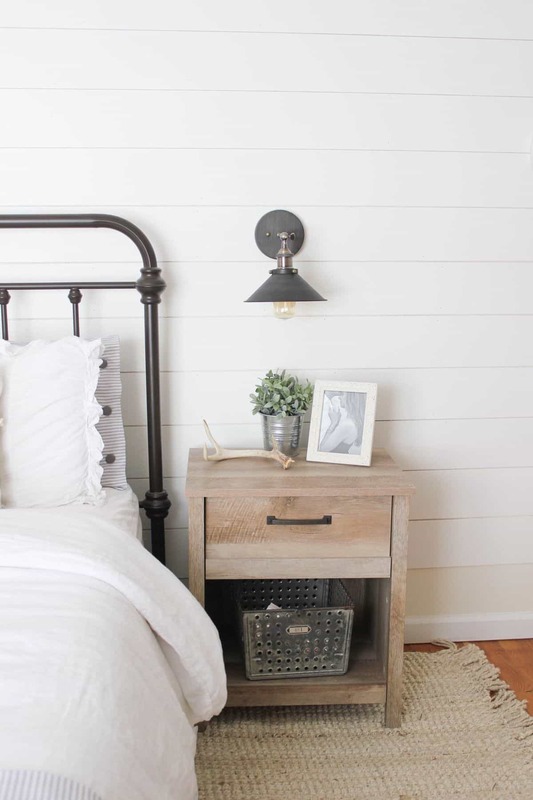 For a simple farmhouse bedroom, place a wooden bedside table with a distressed finish. Put simple sconces on the wall as well. Then, set a rattan chair in one corner of the room. Done! 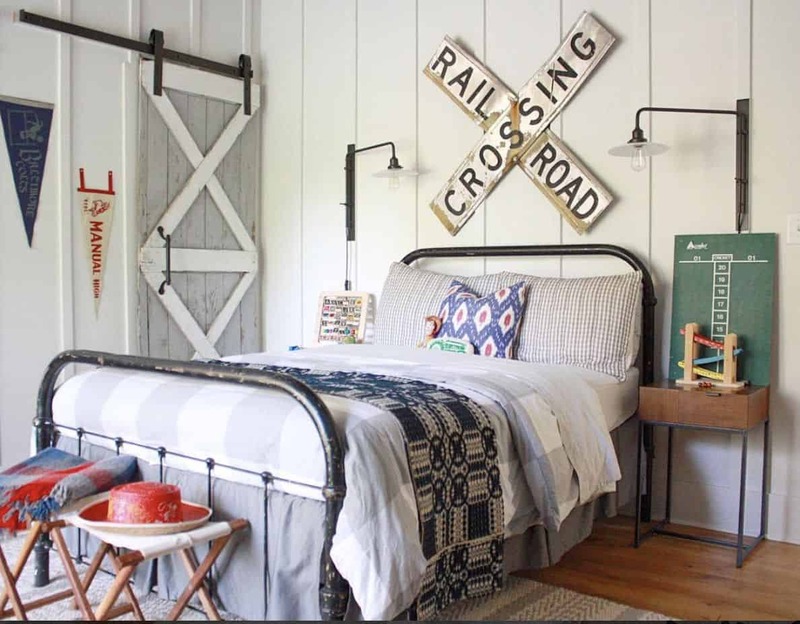 Hopefully, these farmhouse bedroom ideas can inspire you in managing your space!